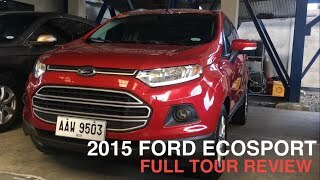 Ford with the release of its all new EcoSport 2015 SUV has gained accolades all across. Well the reason behind isn’t just design, nor its affordability or fuel efficiency; instead it’s all of these amalgamated in a single model to present customers with something refreshing. Looking at this we are sure of company’s intention to overtake a large market and take the model line mile ahead of rest in segment. Let us have a closer look to know what all has been encapsulated inside this new release. 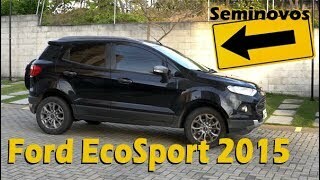 Interior of Ford EcoSport 2015 is highly innovative and comfortable. First thing as we entered came into notice is the perfect driving position which comes through adjustable seat height and steering column, giving you liberty to bring them to your convenience level rather than self running to take a posture according to them. 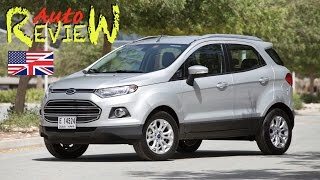 There is also enough of space provided in the interior of Ford EcoSport 2015 with some extra space provided through door pockets, cooled glove box and slide-out drawer under front passenger seat. Talking about features added inside EcoSport 2015; it comes with Cruise control, Hill Start Assist, automatic wipers headlights and rear parking sensor. For entertainment and connectivity you have Ford SYNC in-car connectivity with voice command. 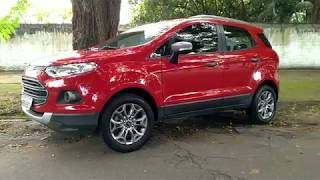 Exterior of Ford EcoSport 2015 is stylish with its looks. Starting with the front fascia, it comes with a short bonnet and raked front pillars. Angular headlamps sit remarkably alongside the five-piece grille featuring chrome front. Ford’s signature LED light strips stay at their place. Beneath the headlights mounted are the fog lamps while indicator strips are incorporated in the rear view mirror cap. The entire bottom part gets black tone while the upper body color changes depending upon your preference out of the presented list. Tailgate comes mounted with extra wheel adding to the sporty look of model. Ford EcoSport 2015 gets its power through the three time award winner 1.0 Liter EcoBoost engine which delivers 123 hp of total output. We believe it’s sufficient for a day to day ride and if you think it isn’t then here you have its remarkable fuel efficiency stat standing at 53.3 mpg and CO2 emissions to be at 125g/km. You also have as an option a 1.5 liter engine delivering 110 hp and the same displacement diesel engine delivering 88 hp; difference in both of them lies in the economy figures.